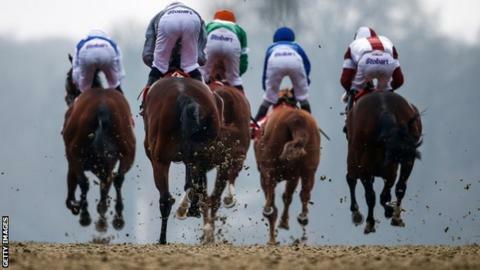 Trainers have announced a boycott of two races at Lingfield's Winter Derby Day on Saturday in protest at the amount of prize money on offer. The five-furlong Novice Stakes had nine entries at the five-day stage, but no horses have been declared for the race. Nick Litmoden's Greybychoice was the only entry for the Novice Stakes over a mile, giving him the £4,500 prize. Lingfield is owned by Arena Racing Company (ARC), which has been criticised of late for its prize funds. The course elected to reduce its contributions because of concerns over the impending cut to maximum stakes on fixed odds betting terminals. Trainer Phil McEntee said: "The prize money levels we are racing for in 2019 are simply not acceptable and I, for one, am absolutely delighted with what's happened." ARC said "constructive talks" to resolve the situation are ongoing. And National Trainers' Federation chief executive Rupert Arnold said: "The NTF, Racehorse Owners' Association, Racecourse Association and British Horseracing Authority are working together to see if we can help resolve the situation with prize money."